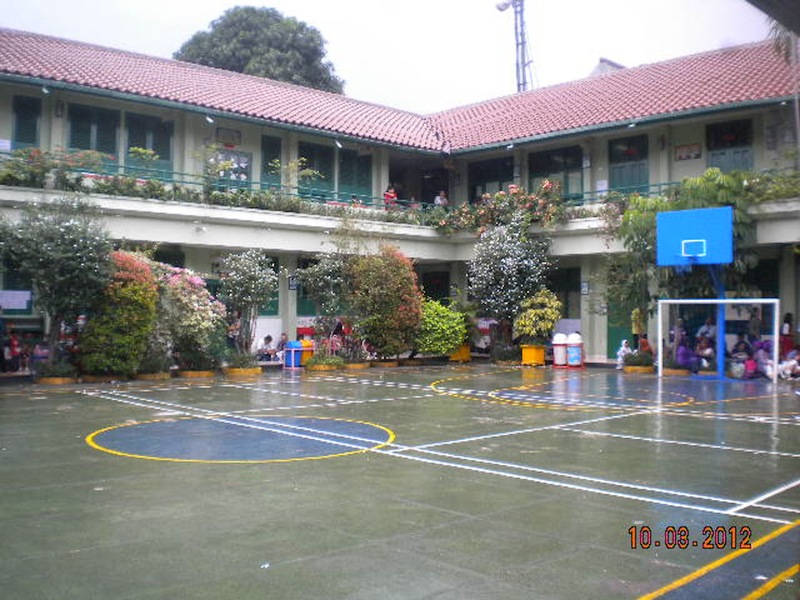 It is SDN Menteng 01, the school where the former U. S. president, Barrack Obama, used to go to when he lived in Jakarta for roughly four years. There is a statue of him and a plaque on the wall before you enter the gate, if you need proofs. We, students, call it Besment for short, which stands for Besuki Menteng, the name of the school’s street. Despite being one of many formalities in my educational background, Besment holds a sentimental value to me as here is where a lot of eventful occasions occurred, including my first love. He and I were in 4th grade in Besment when the remarkable affair happened. I remember the green walls of my classroom. The door was fully opened, thus the air conditioner was switched off, making the packed room extra humid. The smell of sweat and sun mixed with air freshener was indeed funky. I walked to my table, two rows from the back, after having changed into the regular green and white uniform from P. E.’s blue and white tracksuits in the small restroom. Besment had a rolling table system every week, so there was no permanent table. Not long after, the school’s bell rang, signaling that it was time for the first break. I was putting my tracksuits into my backpack when he barged into class, still wearing his P. E. tracksuits, and approached me. He handed me a love letter with white heart-shaped chocolate slipped inside the envelop, had eye contact with me for brief seconds, then walked away immediately, almost running. My best friends gathered around me curiously and squealed after having noticed the chocolate inside. Panicked and not knowing what to do, I threw the letter in a trash bin, gave the chocolate to my best friend, and went on about my day. Ever since then, tables have turned. He never tried to interact with me, but I started to look at him differently, loving-gaze different. Days after the situation, I admittedly found him quite charming when he played basketball with our other friends at Besment’s unquestionably massive green-colored field right at the center of the building. Besment had always been painted with green all over the building, I never understood why. Other times, when he played soccer at the very same field, the way he ran around and shouted his teammates’ names, the way he would get competitive during matches, were enticing to me. Those repeated observing from the side of the field, on the brown bench to be exact, episodes was when I knew I had fallen for him. There were also moments when he would walk near me in the narrow hallway, came to my seat when he longed to chat about irrelevant but secretly meaningful topics with me, or as simple as borrowing one of my stationaries in class. All of those interactions puzzled me because I thought he would never talk to me again since I unfortunately turned him down. I always wondered whether or not he still had feelings for me or he just did those memorable actions with no intention at all. He had never done them previously, even way back before the day he confessed. Circumstances would have been different if he did all of his sweet moves before handing me the innocent letter. Weeks went by and I started having daydreams about this particular charismatic boy. My heartbeats would go quicker when he was around and some breaths would be harder to take when his eyes looked at mine. Back then I would continually buy either guava or melon juice from a juice stall at the canteen. Little did I know it was his cherished beverage stall, too. Besment’s canteen always had dimmed lightings, a few food stalls, spacious, and overall cozy. There were diverse food options available and my favorite was noodle soup with meatballs. I think his was melon juice and Sate Padang because I caught him ordering them a number of times. Although the canteen was comfortable, roomy, and had dining tables, my best friends and I’s best-loved spot to eat was Bangsal. Bangsal was a wide space located before the field and the first area you see when you enter the gate. There were trophies displays, photos of Besment’s activities, a huge poster of Obama, also posters of events. Besment did not have a wall magazine, therefore they plastered photos and posters on Bangsal’s walls. Students often times went there to either eat or play and sometimes, if it was raining heavily, we would held Monday ceremonies in Bangsal. Daydreams of him happened frequently during classes. I would sit in my table with my hands put underneath my chin supporting them, staring into nothing, and imagining romantic scenes that I wished would happen with him. Time after time I would catch glimpses of him on his table, already looking at my direction. We would look away quickly and I had to repeatedly catch a breath, smiling to myself. Many times I had tried to start conversations with him on either Facebook or text messages and the responses was warm. My best friends would tease me whenever he was around, nudging my elbow faintly. At this point, everyone knew I was having a huge crush on him. Not only he was exceptional at sports, he was also excellent at music. He could wonderfully play guitar and piano. It is not surprising for me to acknowledge that he is now a guitarist in a skyrocketing band. Our music class was regularly held in the music room located near the first grader’s class. The room temperature there was always freezing cold because the air conditioners were constantly switched on. We would always put our shoes in shoe racks positioned in front of the room before entering because the floor was fully carpeted. Music room was actually incorporated with the library. The bookshelves were all brown and installed on the floor. Books were set neatly and in accordance to its categories. There were also a few round tables where students would sit around either to read books or chat noiselessly. It is definitely ironic when you combined music room and library together because we had to keep quiet, but also play musical instruments, such as guitar or recorder, and sometimes sing songs our music teacher had chosen, aloud. The first time I watched him play piano was in that serene room. There was a black rarely used piano allocated in the room and I recall he played Beethoven’s Fur Elise handsomely. We have never done anything significant romantically and that did not stop me from loving him freely. I felt contented enough to having known him from Besment, the place where I spent more or less six years of my childhood in. The ecstatic feeling lasted until right after we graduated and went to different junior high schools. Three years of swift glances at each other, small talks of complete nonsense, and watching him closely played basketball gorgeously. Eventually, he ignored my messages and altogether stopped talking to me. I thought he felt annoyed and had enough of me. From that stage, I told myself that I had to stop and let go of the delirious feeling. This has been what I assumed to be a one-sided love story and as they say, “your first love isn’t the first person you give your heart to―it’s the first one who breaks it”.